Public discontent with Congress has reached record levels, and the implications for incumbents in next year’s elections could be stark. Two-in-three voters say most members of Congress should be voted out of office in 2012 – the highest on record. And the number who say their own member should be replaced matches the all-time high recorded in 2010, when fully 58 members of Congress lost reelection bids – the most in any election since 1948. The Republican Party is taking more of the blame than the Democrats for a do-nothing Congress. A record-high 50% say that the current Congress has accomplished less than other recent Congresses, and by nearly two-to-one (40% to 23%) more blame Republican leaders than Democratic leaders for this. By wide margins, the GOP is seen as the party that is more extreme in its positions, less willing to work with the other side to get things done, and less honest and ethical in the way it governs. And for the first time in over two years, the Democratic Party has gained the edge as the party better able to manage the federal government. To be sure, neither party’s leadership is viewed positively right now. Just 31% approve of how Democratic congressional leaders have performed. But even fewer (21%) approve of the job Republican leaders have done. And a good deal of this criticism is coming from within the GOP base. While Democrats approve of the job their party’s leaders are doing by a 60% to 31% margin, only 49% of Republicans approve of the GOP leaders in Congress are doing, while 44% disapprove. The latest national survey by the Pew Research Center for the People & the Press, conducted Dec. 7-11, 2011 among 1,521 adults, finds that Republicans are as eager to see big changes in Congress as they were two years ago. Despite their party’s majority status in the House of Representatives, seven-in-ten Republicans say most members of Congress should be replaced, as do 73% of independents and 60% of Democrats. This stands in stark contrast to the last several election cycles, when voters from the party with a House majority have said most members should keep their jobs. In fact, one of the few areas of bipartisan agreement when it comes to views of Congress is that the problem with the institution is the members themselves, not the political system. 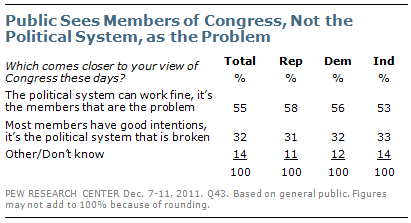 In assessing Congress, 55% of the public says they think the system can work fine, it’s the members that are the problem. Just 32% say they think most members have good intentions but the political system is broken. The balance of opinion is virtually identical across party lines. Independents, who have expressed great frustration with Washington gridlock over the course of the past year, are particularly critical of the Republican Party. By a 54% to 30% margin they say the Republican Party, not the Democratic Party, is more extreme in its positions, and they are twice as likely to label the Republicans than the Democrats as the less honest and ethical party (42% vs. 21%). Yet independents have few positive things to say about the Democratic Party either. Both parties’ leaders get poor approval ratings from independents (14% approve of GOP leaders in Congress, 23% of Democratic leaders). And when independents are asked which party can best handle the most important problem facing the nation, as many volunteer “neither” as say the Democrats or the Republicans. 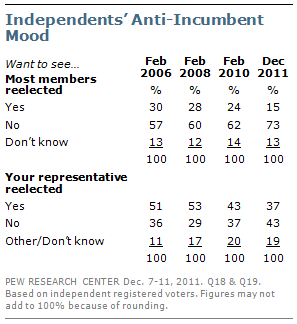 As a result, entering the 2012 election cycle independents are expressing more hostility toward congressional incumbents than usual. For the first time in nearly twenty years of polling, more than seven in ten (73%) independents want most members of Congress replaced next year. And just 37% think their own member should be returned to office, while 43% say he or she should be voted out. The arguments and concerns of the Occupy Wall Street movement are supported by many Americans, but most continue to reject the core conclusion that America is divided into a nation of “haves” and “have-nots.” Moreover, while the Occupy Wall Street movement draws more support than opposition, its tactics are criticized, with far more saying they disapprove than approve of the way the protests have been carried out. By a 44% to 35% margin, more Americans support than oppose the Occupy Wall Street movement overall, and by 48% to 30%, more say they agree than disagree with the concerns the protests have raised. 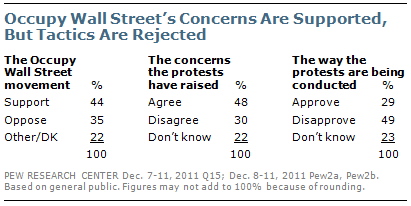 But when it comes to the way the protests are being conducted, significantly more disapprove (49%) than approve (29%). Many of the themes of the Occupy Wall Street protests resonate with the public. About half (51%) say that Wall Street hurts the American economy more than it helps it; 36% are of the view that Wall Street helps more than it hurts. A 61% majority say the economic system in this country unfairly favors the wealthy, while 36% say it is generally fair to most Americans. And fully 77% say that a few rich people and corporations have too much power in this country. While still a minority view, the current survey finds 40% saying that hard work and determination are no guarantee of success, higher than in any other survey conducted over the past 17 years. But at the same time, most Americans (58%) continue to reject the notion that American society is divided into two groups, the “haves” and the “have-nots.” And when pressed to choose, more Americans describe themselves as part of the “haves” (46%) than the “have-nots” (39%). About three-quarters (76%) see the size of the national debt as a major threat to the economic well being of the United States, the highest of five issues tested. A smaller majority (59%) sees economic competition from China as a major threat, and about as many (56%) say the same about the power of financial institutions and banks. Only about half (46%) say the economic problems in Europe pose a major threat to the U.S. economy, and 44% see government regulation of business as a major threat. Most Americans (55%) continue to cite economic issues as the most important problem facing the country. But the percentage citing any economic issue has fallen 13 points since May, from 68%. At the same time, an increasing number cite problems with government, including dissatisfaction with government and politics, partisanship and lack of political leadership. Currently 15% mention a problem associated with government and politics, up from only 4% in May. About one-in-five (21%) say that unemployment is the biggest problem facing the country, the top economic issue cited. About one-in-ten (9%) volunteer the debt or deficit, little changed since May (10%). Other economic issues, such as inequality (2%) and problems with Wall Street and banks (1%), receive very few mentions. Nearly four-in-ten (38%) say the Democratic Party can do a better job of handling the issue they point to as the top national problem; 32% say the Republicans can better handle this problem. One-in-five (20%) say neither party can better handle the issue.